Winter in Wyoming is epic. The Bighorn Mountains are pure bliss for the snowbound, offering deep powder, fresh trails and spectacular mountain vistas for months on end. Events across Sheridan County keep the home fires burning, and our hotels, lodges, ranches and resorts offer up unique adventures for those bold enough to experience the wintry wild west. Here are five adventures to add to your bucket list this winter season. The Bighorn National Forest spans over 1.1 million acres. Sure, you could take a drive up the Bighorn Scenic Byway, but you’d only experience a fraction of all the mountainous glory. 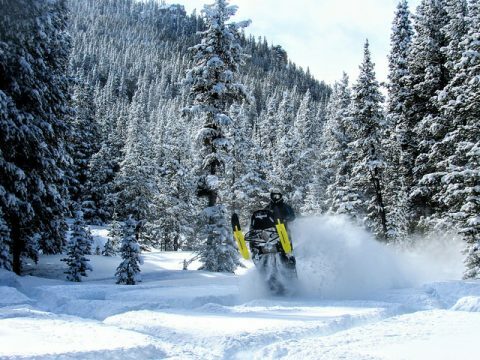 The best way to truly soak up everything the Bighorns have to offer is by snowmobiling. With over 218 miles of freshly groomed trails and nearly limitless backcountry access you can get wild this winter. Take a thrill ride through Granite Pass with the guides at Sled Wyo or fly down Sawmill Pass Trail (Trail-A) to see panoramic views of the 189,000 acre Cloud Peak Wilderness. If you don’t have a snowmobile, don’t worry: Bear Lodge has plenty of new sleds for you to rent, or, as an alternative you can try the new Timbersleds from Arrowhead Lodge. The Sport Stop in downtown Sheridan has everything you could possibly need for conquering the Bighorn backcountry. From Cross-Country skis to snowboard and snowshoe equipment, the Sport Stop can you hook you up. Shell Canyon hosts some of the deepest and steepest downhill skiing in the area. About an hour drive from Sheridan, follow the Bighorn Scenic Byway until you get the Ranger Creek Parking area. You’ll often have these slopes all to yourself; shred on. If you are looking for easier access to the slopes, the Antelope Butte Mountain Recreation Area is working hard to re-open what has long been one of Wyoming’s most beloved ski areas. You can now peddle year round through the Bighorns. Just ask the folks at the Sheridan Bicycle Company. They can hook you up with Fatbike rentals for the day. 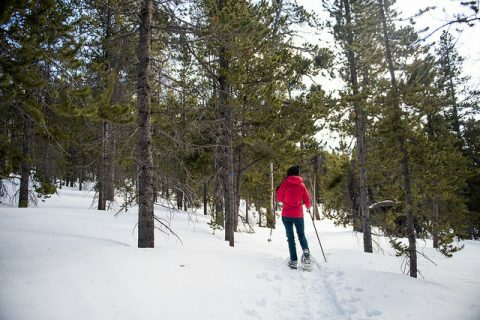 There’s a variety of nordic ski trails in the Bighorns to satisfy your craving for adventure. 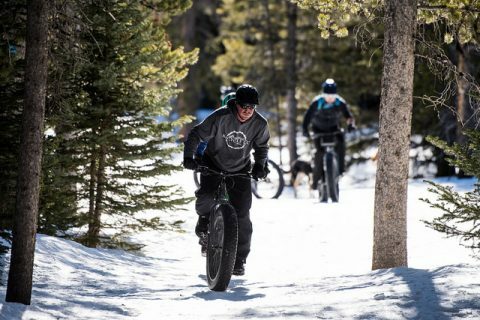 The Cutler Hill trail, just off the Bighorn Scenic Byway is a great place to start your Fatbike escapade. 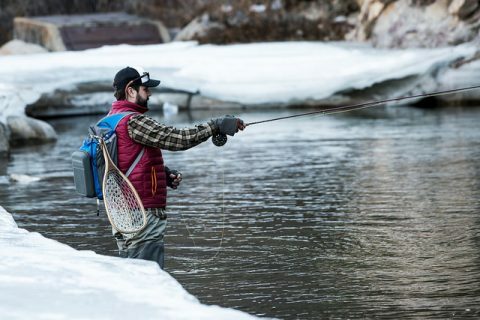 Access to the trout filled streams and lakes may be more of an adventure during winter months, but that doesn’t stop the fly fishing junkies at the Fly Shop of the Bighorns from getting their fix. Go on a journey with them to the Bighorn River to catch some monstrous rainbow and brown trout. You will forget all about the cold the moment you hook onto a wild trout. Make your reservations in advance. If you’re looking for a more relaxed adventure but still want a chance to reel in that world record fish, try ice fishing on one of the nearby reservoirs or lakes. Tongue River Reservoir, about 15 miles north of Sheridan, is brimming with northern pike, lake trout, and walleye. Sibley Lake is another popular destination for ice fishing. Just off the Bighorn Scenic Byway about 40 minutes from Sheridan. This mountain lake is home to various fish species and and mountain views to fulfill your adventure needs. To put it simply, Skijoring is the best event you’ve never heard of. It’s where cowboys meet ski bums in an epic sporting event. Skijoring is the action of being pulled over snow or ice on skis by a horse. The skier tries to grab a series of rings while racing down the snow packed road. The challenge is being able to swing from side to side to grab the rings, while handling immense jumps, and holding on to the rope that is attached to a horse traveling at 35 mph. It’s a sport straight out of ESPN 8 “The Ocho” and it’s coming to Sheridan’s historic downtown February 16th and 17th. Skijoring America has added Sheridan to their national circuit for the 2018-2019 race season. Professional skijorers will be coming from all over the country to race and put on a show you won’t forget. You don’t have to a professional to race in this event. You can register but it’s BYOSHR (Bring Your Own Skis, Horse, and Rope).